Lake Erie's main islands are great places to visit for a change of attitude. Life definitely runs on a different time table when you're on the islands. 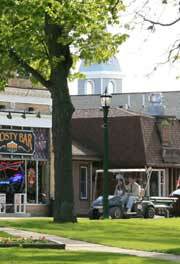 Put-in-Bay is the heart of South Bass Island and is located just north of Sandusky on the mainland. 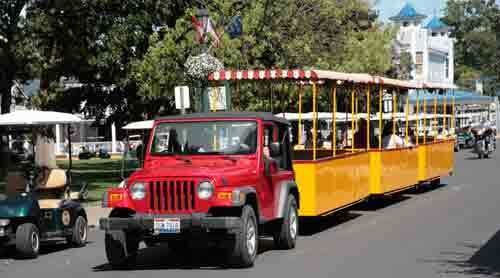 Put-in-Bay's main industry is tourism that runs from April thru October. 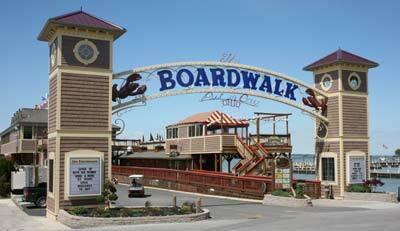 Put-in-Bay has to be the party capital on Ohio's north coast whether you're a weekend tourist, day-tripper, or boating enthusiast. The harbor has an abundance of bars, nightclubs, and saloons. When the tourist season gets going full blast on Memorial Day weekend, every night is a good night for a party. If you don't have your own boat, main access to the island is by ferry boat. Jet Express drops you off right in the harbor next to the boat docks. The other ferries make port on the southwest side of the island, about 1.5 miles from downtown Put-in-Bay. If you don't come in on the Jet, once on the island, there is a $2 shuttle from the dock into town or you can rent bikes and golf carts to get around, or the walk isn't too bad either. 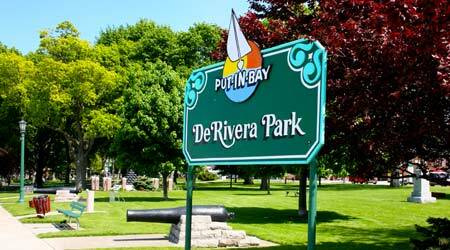 DeRivera Park was named after Jose DeRivera St. Jurgo who bought South and Middle Bass Islands and lived on the island during the mid 1800s. He built a sawmill, started sheep herding on the island and first introduced grapes and wine making to the area. Once it became known that grapes not only could be grown on the islands, but actually thrived here, land prices skyrocketed from $10 to $1500 an acre within 10 years. Check out the Put-in-Bay Brewing Company on Catawba Avenue. It is the island's micro brewery where you can see plenty of action during the summer months. Housed in the old Put-in-Bay fire station, the Brewing Company offers an enclosed patio, 2 story dining and regular entertainment. Plus, besides their own fine micro-brews, they offer 100 different beers from around the world. New attraction is the Museum of Island Life located in the historic Doller House which features Put-in-Bay's last ice house. The museum covers 100 years of island life. For more information about the many other attractions on the island, see our page about South Bass Island. In 1784 an unidentified group of explorers sailed around the 20 some islands in Lake Erie's western basin. On their charts, they identified one harbor of one island in particular as "Pudding Bay" because the shape of its harbor reminded them of a pudding bag. That island, now called South Bass Island, gained fame during the War of 1812 as the base from which Oliver Hazard Perry sailed, that ultimately led to the defeat of the British fleet in the Battle of Lake Erie. 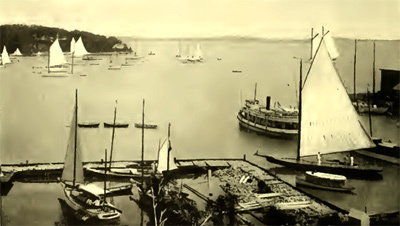 Up until the beginning of the Civil War, Put-in-Bay was one of Ohio's busiest ports. William Henry Powell painting of Perry's Victory commemorating the Battle of Lake Erie in the War of 1812 was the first piece of artwork commissioned for the Statehouse in 1857 and was installed in the State Capitol in early 1865. Commodore Perry is the central figure standing in the row boat and is considered the soul of the picture. With outstretched arm, and resolute and confident look, unconscious of his little brother, who is seen tugging at his brother's coat, or of the deprecating gesture of the helmsman to make him sit down and avoid exposure to enemy fire, Commodore Perry is displayed with courage and leadership that led to the great Victory of Lake Erie. After seeing Powell's work, the United State Senate commissioned him to create a similar painting for the United State's Capitol Rotunda. "We have met the enemy, and they are ours. Two ship, two brigs, one schooner, and one sloop." Today there is a monument to Perry's victory on the isthmus of the island which opened to the public in 1915 and became a national monument in 1936. 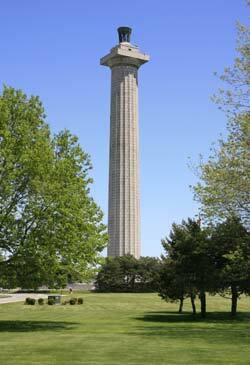 The observation deck offers a wonderful view of Put-in-Bay Harbor and South Bass Island. The most noticeable feature is the Perry Victory and International Peace Memorial which opened in 1915. The Memorial was originally designed to honor the victory of Commodore Perry over the British fleet in Lake Erie, it's purpose was expanded to include the long standing peace between the United States and Canada. The Memorial became part of the National Park Service in 1936. There is also an observation deck which is 317' above Lake Erie. The deck was closed for most of 2007 for repairs. John Eisemann, the designer of the Ohio State Flag, submitted a design for the Perry Memorial however, his original design was passed over in favor of the design of architects Joseph H. Freelander and Alexander D. Seymour, Jr., of New York City. Eisenmann was awarded a $1,500 consolation prize, but his idea of placing the memorial on the isthmus on South Bass Island was regarded as the ideal site for the memorial. If you like to party, there's always something going on in the Village just about every night of the week in season. If you prefer the more quiet life-style, there's also Victorian hotels, resorts, wineries, a cave, a butterfly house and a campground. The Lake Erie Islands Hisotrical Society was founded in 1975 when a groupd of island residents decided it was important to save for future generations, the island's history. The museum is open daily through the suymmer and on weekends during the spring and fall. South Bass Island is often referred to as Put-in-Bay Island. Put-in-Bay is the name of the harbor on the northwest side of the island and the town next to the harbor. South Bass Island is approximately 3.7 miles long and 1.5 miles wide and is about 1,588 acres in size. Located In the bay is Gibraltar Island, home to the Ohio State University's Stone Laboratory. On July 1, 1907, Dr. Lee deForest broadcast the first ship-to-shore radio message from the steam yacht Thelma. The communication provided quick, accurate race results of the Annual Inter-Lakes Yachting Association Regatta. Frank Butler, a Monroeville, Ohio native and assistant to deForest, was stationed in the pavilion at Fox's Dock (today where the Jet Express Dock stands) and received the radio transmission. The creation of the vacuum tube by deForest permitted the rapid development of radio and eventually television. The inventor disliked the existing term "wireless" and instead chose a new word: radio.